What a Drag is The Carlton Clubs monthly trivia night. 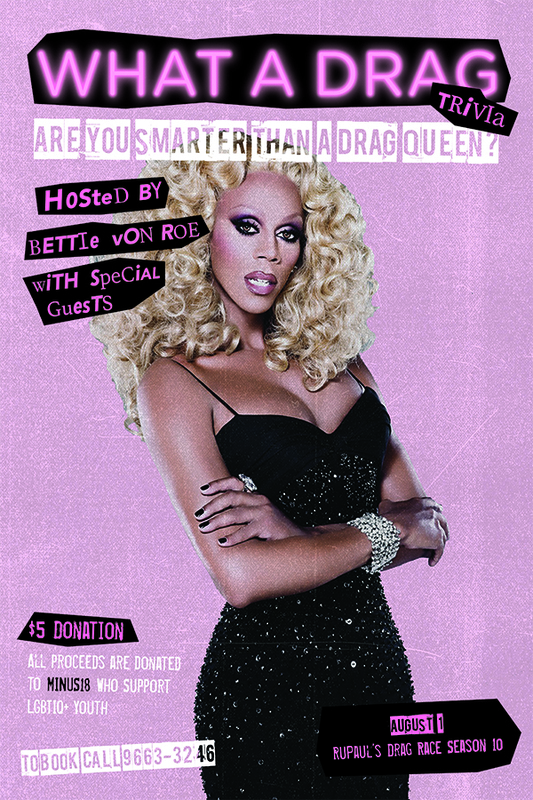 Hosted by the Bettie Von Roe, expect glamour, laughter and performances by some of Melbourne most exciting drag talent. Each month we focus on a new pop culture theme. Next we’re heading back to everyone’s favourite drama hub, the Drag Race workroom for season 10 of RuPaul’s Drag Race. So get on Stan and rewatch every episode because we are going in on these queens. We want everyone to be happy under their rainbow, which is why tickets are FREE although if you wish to leave a donation at the door that is very appreciated. 100% of the donation will be going to Minus18, an incredible organization which supports LGBTIQ+ youth. So ask yourself, Are you smarter than a Drag Queen? Bettie Von Roe is up to the challenge. ARE YOU SMARTER THAN A DRAG QUEEN?